Yokogawa Electric Corporation (TOKYO: 6841) announces that it has developed Process Data Analytics R1.02 software as a solution in Yokogawa's OpreX™ Asset Operations and Optimization family, and will release it in November. Process Data Analytics is a software package that can detect quality and productivity issues early on in the manufacturing process by analyzing data on processes, facility status, and operation history. Process Data Analytics R1.02 includes new functions for the import of data from plant information management systems (PIMS), configuration of data display settings, and capture of graph data that improve data analysis and shorten the trial-and-error cycle. Product quality is affected by factors such as fluctuations in the quality of raw materials and the aging of manufacturing facilities. To help address such problems, manufacturers are turning to digital technologies and solutions such as AI, big data, and Industrial IoT (IIoT). Yokogawa's Process Data Analytics software uses the Mahalanobis Taguchi (MT) method* to quickly and efficiently analyze temperature, pressure, flowrate, liquid level, and other process data from a PIMS; facility operation and maintenance status information; and operation history data. When used together with Yokogawa's analytical services, this software can help to improve product quality. Following the May 2017 release of Process Data Analytics R1.01, process engineers and data scientists from Yokogawa and its customers worked together to improve this product. Based on their findings, enhancements have been made to this software that enable the import and analysis of data from other vendors' PIMSs, simplify and speed up the changing of settings and execution of calculations, and make it easier to prepare reports. These enhancements to the software improve operating efficiency, improve the quality of data analysis, and shorten the trial-and-error cycle. At plants all over the world, a wide variety of data-gathering systems from different vendors are in use. For effective analysis, it is important to be able to access all the data collected by these systems. The Process Data Analytics software runs on WindowsR PCs and accesses files from PIMSs, DCSs, and PLCs that have been converted to CSV format. Process Data Analytics R1.02 comes with an OPC historical data access (HDA) interface, which is the global standard for data exchange in industrial automation and other industries. Thanks to this feature, the software can easily import data from PIMSs that support this standard. 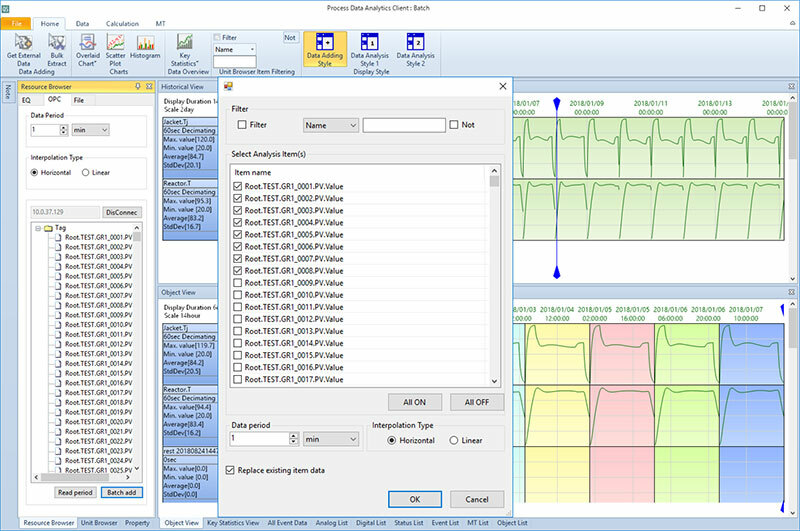 To make it easier to analyze data, Process Data Analytics R1.02 enables the overlay of multiple process data charts. Settings such as the data start point and the display colors can also now be easily modified depending on the manufacturing conditions. Benchmark tests conducted by Yokogawa analysts have shown that these features enable an 80% decrease in data analysis time. To facilitate the exchange of data analysis results among engineers, Process Data Analytics R1.02 has a new function that enables engineers to capture graphs showing their analysis results and paste this data into any general-purpose reporting software. This eliminates the need to reproduce these graphs and allows analysts to focus their efforts on studying and discussing analysis results. Manufacturers all have the need to access and analyze field data to improve quality and productivity, and are turning to cloud computing, AI, big data, the IIoT, and other advanced technologies and solutions to address this need. To satisfy such needs and thereby help its customers improve product quality, Yokogawa will continue its efforts to develop products that utilize these technologies and solutions. * A pattern-recognition technique thatis named after Dr. P.C. Mahalanobis, who introduced the Mahalanobis distance, which is a multivariate measurement scale based on the correlation among variables, and Dr. Genichi Taguchi, who was one of the key figures in the development of quality engineering. Based on the distance between reference data and sample data, this method can quantitatively determine the deviation from the target data. OpreX is the comprehensive brand for Yokogawa's industrial automation (IA) and control business. The OpreX name stands for excellence in the technologies and solutions that Yokogawa cultivates through the co-creation of value with its customers, and encompasses the entire range of Yokogawa's IA products, services, and solutions. This brand comprises the following five categories: OpreX Transformation, OpreX Control, OpreX Measurement, OpreX Execution, and OpreX Lifecycle. Process Data Analytics, an OpreX Asset Operations and Optimization family solution in the OpreX Transformation category, delivers operational excellence throughout an enterprise's activities, from production through to supply chain optimization and risk and business management. The Process Data Analytics application program analyzes process data, facility status information, operation history, and other data to detect a decline in quality or productivity early in the manufacturing process.